How much does a CNA make in Kansas? Certified nursing assistants in Kansas can earn different amounts depending on their skill level, type of facility they are employed at, and city or town they work in. 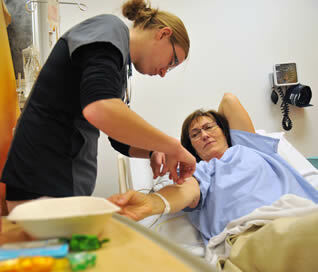 The demand for certified nursing assistants is high in Kansas. CNAs perform various tasks and responsibilities to clients and they are being supervised by LPNs or registered nurses as they implement them. CNAs are regarded as main caregivers in most medical facilities because they work about eighty percent of their time with patients. This is why they are well-compensated with a good amount of salary as they work in Kansas. However, compared to other parts of the nation, Kansas provide lower wages to certified nursing assistants. The reason for this is that the cost of living in Kansas is lower in comparison to the other states. Even though the salary wage is lower, individuals feel that they are reasonably paid because they are still able to live a comfortable life. For those looking to pursue a certification to work in the state the growth potential of this occupation is encouraging. The Bureau of Labor Statistics is anticipating that employment for nurse aides is going to grow by about nineteen percent between 2010 and 2020. This is fast compared to other occupations. According to the Kansas Department of Labor, the average salary of certified nursing assistants at entry-level is around $20,750 for each year and approximately $9.98 for every hour. CNAs with experience will have an average salary wage of $24, 170 annually or $11.62 per hour. With more work experience, CNAs can get paid up to $30,000 yearly especially when they stay longer in one employer. Entry-level certified nursing assistants receive lesser salary wage compared to experienced CNAs. Moreover, CNAs with experience can even get better benefits which include paid sick days as well as paid vacations. The employers also play a role with regards to how much CNAs get for salary. Employers like home health agencies and nursing homes have the tendency to pay lower salaries compared to government agencies or hospitals. However, there is a condition that you should keep in mind if you prefer to work in high-paying facilities. Most of the employers from these facilities will be asking for a minimum of one year work experience of related background. It is then important that you gain experience prior to applying to bigger facilities for greater chances of getting hired. There are various employment settings where certified nursing assistants can work and their annual yearly income can change depending on which facility they are working at. The following are different cities located in Kansas and the corresponding annual base salary of certified nursing assistants. There is a growing career ahead for certified nursing assistants in Kansas. Individuals seeking work in the medical field can consider this job which will help you gain experience in the profession. Not only that workers are able to provide care to clients and also receive a reasonable income. To learn more about enrolling in CNA classes in Kansas visit this directory page.